In response to the concerns of Colombian social organisations and trade unions JFC led a Europe-wide campaign to stop the EU-Colombia FTA. Although the treaty was passed by the EU, as a result largely of JFC campaigning the bill was significantly delayed, included additional human rights elements and the entire European Labour Party voted against the bill. See here for TUC statement on EU-Colombia Free Trade deal. End British Military Aid to Colombia! JFC campaigned to end British military support for the Colombian security forces. Although military cooperation continues between Britain and Colombia, in 2009 some elements of the military cooperation was ended by the then Labour government due to the human rights concerns. See here for a Guardian article on British military aid to Colombia. Colombia’s legal system has been used for many years to silence individuals and organisations campaigning for human rights, labour rights and social justice. Whilst the 2016 peace agreement allowed for many political prisoners to be released with their cases reviewed by the transitional justice system. 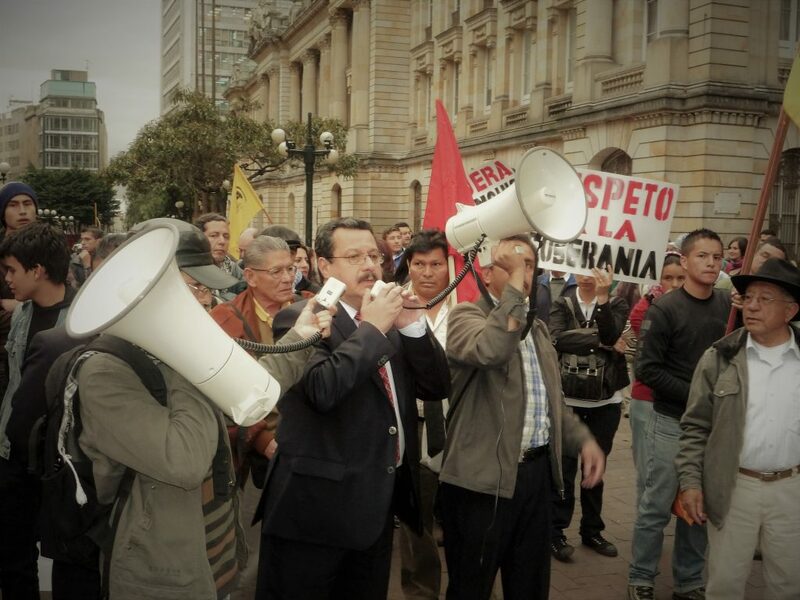 nevertheless the Colombian legal system continues to be used to persecute activists. 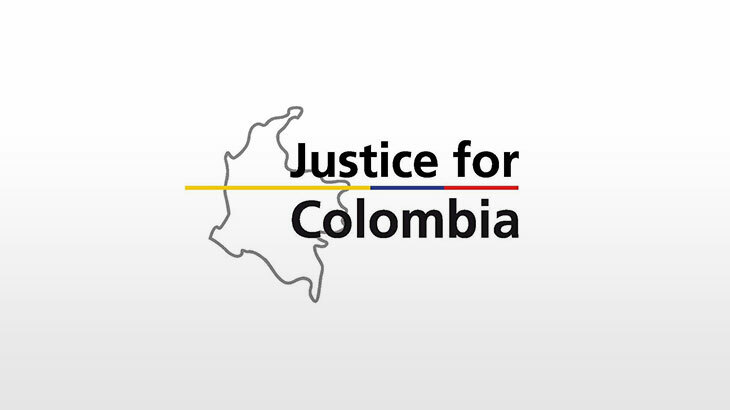 Justice for Colombia has been part of successful campaigns to set free over twenty political prisoners. See here for a current related campaign. And see below for a video on our campaign to Free Huber! David Ravelo, a leading Colombian human rights activist, was detained by the Colombian authorities on 14 September 2010, falsely accused of “aggravated homicide”. In June 2017, David finally regained his freedom as his case was moved to the transitional justice system. Huber is a member of the CUT Executive, Vicepresident of the agricultural workers union FENSUAGRO, and National Organiser for the social organisation Patriotic March. He was released in January 2017 after more than 40 months behind bars. Miguel is a Sociology lecturer and a member of the ASPU trade union well known for his studies analysing the roots of the armed conflict. He was twice imprisoned but finally released on 1 November 2016 when he was absolved of charges. Omar is a teacher, an active member of FECODE, the Colombian teachers’ trade union, Omar was released with six others in March 2015 after spending almost three-and-a-half years in jail falsely accused of ‘rebellion’. In January 2013, the head of International Relations for the the Patriotic March social movement, Francisco Javier Toloza, was arrested accused of ‘rebellion’. He was released two months later in March 2013. Members of FENSUAGRO, the Colombian agricultural workers’ trade union, were imprisoned for over 16 months between 2011 and 2012. Others arrested in the same case spent even longer in jail. The human rights activist, Liliany Obando, was imprisoned from August 2008 to March 2012 without trial in Buen Pastor Women’s Prison, accused of “rebellion”. She was forced to serve further time under house arrest before charges were finally dropped. Telmo Cuero Tegue, member of FENSUAGRO, the Colombian agricultural workers’ trade union, was imprisoned from June 2011 to February 2012 in Mocoa prison, Putumayo, accused of ‘rebellion’. He was released without charge after eight months in prison. Carmelo Agamez, a human rights defender and leading activist in the national movement for the victims of state crimes, was imprisoned from November 2008 to September 2011 without being convicted of any crime. Rosalba Gaviria Toro, a FENSUAGRO trade union activist and President of the Women’s Movement for Peace and Human Rights was detained and imprisoned on 9th March 2009 after a police operation filmed live on TV. She was released two years later. Aracely Cañaveral Vélez, a well known leader of the informal workers’ trade union, ASOTRACOMERCIANT, was imprisoned on January 17th 2010. She was released on May 16th 2011. Samuel Rojas, leading member of the Bajo Ariari Regional Human Rights Committee, was detained between September 2010 and February 2011 accused of ‘rebellion’. He was later absolved of all charges. 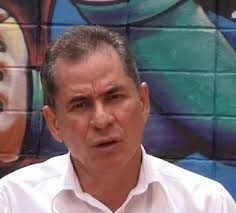 Alirio Garcia, a member of the national executive of the Colombian agricultural workers trade union, FENSUAGRO, was imprisoned between August 2009 and March 2010 accused of ‘rebellion’. He was absolved of all charges. Andres Gil, a leader of a leading Peasant Farmers Association (ACVC) was detained by the Colombian secret police and members of the Army on 29th September 2007. He was held for two years without being convicted of any crime until his release on 31st August 2009. Miguel Gonzalez, a founding member of the peasant farmers’ organisation ACVC, was imprisoned in January 2008. He was released and absolved of all charges in June 2009. Martin Sandoval, president of the Permanent Committee for Human Rights (CPDH) in the Colombian region of Arauca, was released from prison on the 13th May 2009 after being detained for over six months. Carmen Mayusa, human rights defender and leading activist in the Colombian health workers union, ANTHOC. She had been detained since the 11th May 2006 in Buen Pastor Women’s Prison, Bogota. After two years imprisoned without trial she was released in June 2008. Nieves Mayusa, human rights defender and trade union activist, was detained on 11th May 2006 in Buen Pastor Women’s Prison, Bogota. She was released at the same time as Carmen Mayusa in June 2008. Raquel Castro, Colombian teacher and union activist for the Teachers’ Association of Arauca helped to lead the protest that prevented oil drilling in indigenous territory. She was arrested in August 2004 and released more than three years later in August 2007. Samuel Morales, Colombian teacher and union activist for the Teachers’ Association of Arauca was detained on 5 August 2004 and was convicted of ‘rebellion’. On 28th April 2007 he was released after completing his sentence. Hernando Hernandez, indigenous leader and member of the Permanent Committee for the Defence of Human Rights, in Caldas, and the Colombian Agricultural Union FENSUAGRO. He was detained in June 2005 and held without trial until November of the same year. Luz Perly Cordoba, founding president of the Peasant Association of Arauca (ACA) and responsible for the human rights section of the Colombian Agricultural Union FENSAUGRO. She was detained in February 2004, and set free in April 2005. Hernando Hernandez Pardo, former national president of the Oil Workers Union USO, was detained in December 2002 and kept under house arrest for 14 months, without charge. He was released in March 2004.